The year is 1998, and our hero is a 14-year old dex digital. I would write out the story here, but I’ll just let Ghosteo take it from here with the mad drawing skills. 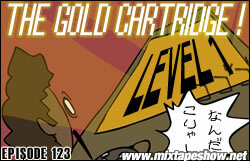 And thus opens today’s episode – The Gold Cartridge, Level 1. Or, if you want the full experience, try it in fullscreen as you listen to the new jawn. So for those of you who missed the ridiculous 5 minute intro skits – here you go. Meek Millz – One For The Money. Hoodfamous on the track. I have to say, this is probably the best flip of the Super Mario Bros sample I’ve ever heard. Even beyond that, this beat just sorta goes hard. And anybody who’s seen any videos of Millz knows that the dude is sort of skurry with it. I mean, I woulda liked some mario references in this cut, but I can’t be mad at him. Shouts to JT for the cut. m/hoodfamous215. Crash N The Boys (NES) – this game was the business back in the day. Most violent pseudo-olympics game I ever played. Teenage Mutant Ninja Turtles (Overworld Theme) (NES) – this game was so stupidly hard it wasn’t even funny. Wow, I forgot how whiny I was as a 14 year old. Oh wow, I completely forgot to do this in the outro, but shouts to B on the in-game announcer vocals. You might remember him as Uncle Chester from the Rock Episode. Anyway, that’s what it is for this week. Apparently there’s a World 2 to this game, so I guess check back next week for another one?